Another second-up win by handy mare Nicci’s Gold at Rosehill on Saturday would tempt trainer Gary Portelli to back her up in next week’s Villiers Stakes or at least aim up at a stakes race. An eye-catching second behind Seasons three weeks ago, where she ran the fastest last 600m of the race in 33.24 (Punters Intel), has Portelli thinking Nicci’s Gold could be in for her best preparation and improving on her record of three wins from four second-up attempts would confirm that view. While the Villiers would be a major step up, it’ll be on the table if her number is in the frame after the TAB Rewards Handicap (1400m). “We were expecting her to run a nice race over 1200m, let her find her legs and hope to beat a few home and be spot on for 1400m,’’ Portelli said. “She ran out of her skin, the winner is pretty smart and I thought the winner might turn up in this race. “I think her distance is probably the mile. We’re toying with the idea if she wins on Saturday of backing up into the Villiers or going to the Gosford mares race. The Gosford race Portelli refers to is the Group 3 Belle Of The Turf Stakes (1600m) run on December 28. Nicci’s Gold, $8.50 with TAB on Thursday, will be ridden by Josh Adams on Saturday and she completed her preparation with an easy work out on Tuesday morning over 800m having burned a bit more than expected on Saturday. “She’s been working strongly, she can not do enough for you at trackwork this girl. She always tries to impress you,’’ he said. Stablemate Single Bullet has been kept on the fresh side since his breakthrough win at Randwick in late October and he pleased Portelli with his Tuesday morning gallop. The gelding worked with noted strong trackworker Exceltic and Portelli has the fingers crossed he can strike again in the Merry Christmas ATC Members Handicap (1100m). “He had a nice gallop on the A Grass with Exceltic and they finished off the work in 10.85,’’ Portelli said. “They weren’t out to have a hard gallop, just a building workout, and the last furlong he put about neck on him on the line. 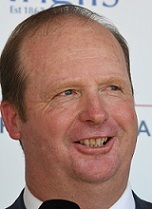 Trainer Gary Portelli (Pic: Steve Hart). “Until I see it happen twice in a row I’m always skeptical about horses that get into a rut. I hope he runs well but I am prepared for him to run well and not win. With that in mind Portelli is hoping Tommy Berry can land Single Bullet in a midfield position from barrier 11 and produce a late burst similar to his Randwick win. “I don’t want to see him back last over 1100m at Rosehill, they string out and you have to come wide and by the time you’re straighten up you’ve died on your run,’’ he said. As for three-year-old Ronstar, Portelli will conclude the gelding hasn’t come up if he can’t produce his best in the 2019 Membership Handicap (1400m) which will be his first run in the blinkers. The trainer conceded he erred by asking the horse to drop 100m after his first-up placing behind Roheryn and he was outsprinted running fifth to Chess Star three weeks ago. “He was basically at his top from the half mile and it hurt late,’’ he said. “We’ll go back to the original thought, ride him where he’s comfortable and give him a chance to be strong.